Online rail booking site Take the train has finally learnt of the existence of Fishguard and Goodwick, thanks to the intervention of Fishguard Trains. 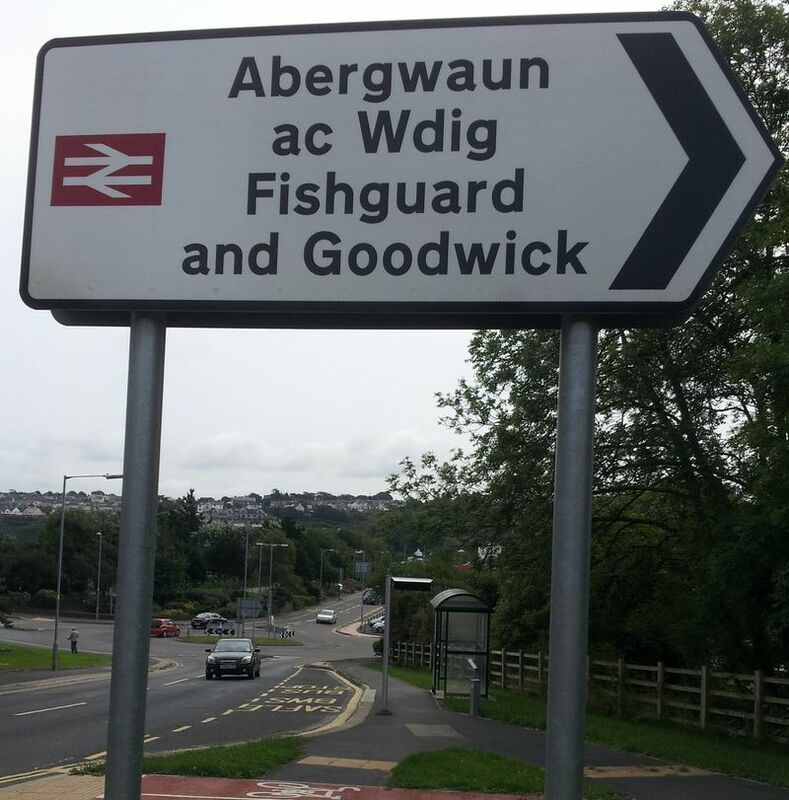 We recently tested nine online rail ticket services, only to find that none recognise the correct station name of Fishguard and Goodwick. 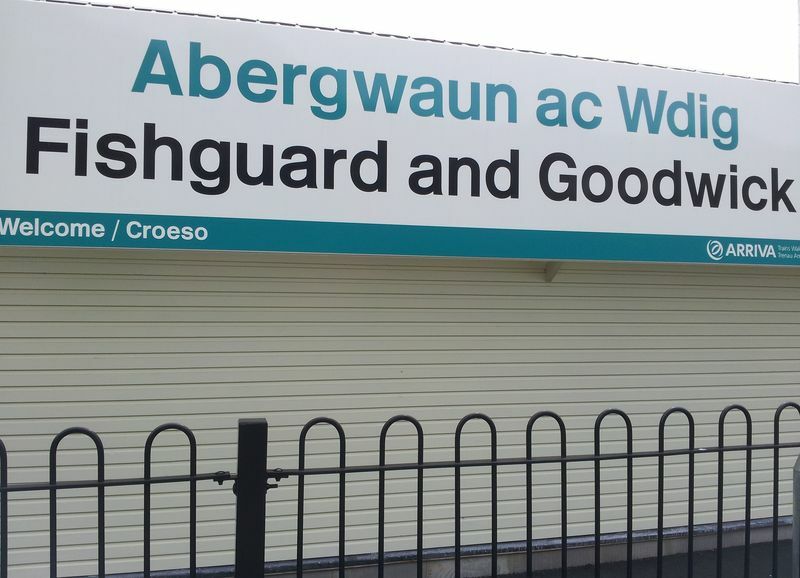 Worst performing site was Take the train, which assured us that Fishguard and Goodwick is available to book tickets from on takethetrain.co.uk, the station is loaded under it’s correct name, Fishguard Harbour. 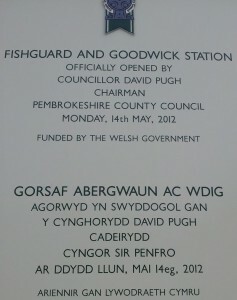 Now it has learnt of the station’s existence from Fishguard Trains, the station appears correctly on its website. Check it out here. Indeed, Take the train is now the ONLY online site that accepts the correct station name. Commenting on the situation, Take the train told Fishguard Trains, We have never received any notification of the opening of this station, which is why it was not loaded onto our site. We are not automatically notified of station openings. Thanks for bringing it to our attention. 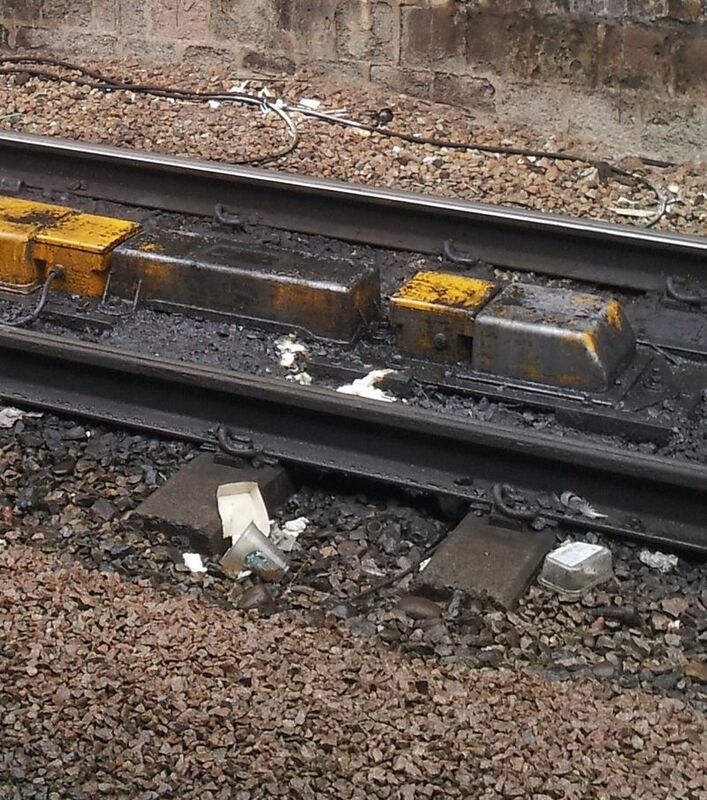 We’re left mystified at this apparently hit-and-miss effort by the rail industry to monitor its own infrastructure. Another success for privatisation? Fishguard and Goodwick – our successful new station – remains unrecognised by every online rail booking service surveyed by Fishguard Trains. That is the shock finding of our new study, well over a year since the station re-opened, boosting the trial rail service which is due for review by the Welsh Government in barely a year’s time. There is little doubt that re-opening Fishguard and Goodwick Station has raised both the profile and the usage of the new service. Fishguard Harbour, so convenient for ferry passengers, was hopelessly unsuitable for travellers to and from Fishguard, Goodwick and North Pembrokeshire. But visible as the new station is to us in the twin towns, the station name remains invisible online. The success of the reopening is no thanks to the online booking and information services that still fail to recognise the new station name. Online booking is a vital way for rail travellers to discover how accessible North Pembrokeshire now is by rail. But go online searching for Fishguard and Goodwick, and you get messages like An invalid station has been entered or Please select a valid departure station. Fishguard Trains tested these nine online services – Red Spotted Hanky, Take the train, East Coast, The Trainline, Raileasy, mytrainticket.co.uk, National Rail Enquiries, Arriva Trains Wales and Traveline Cymru. Not a single site accepts the input Fishguard and Goodwick. 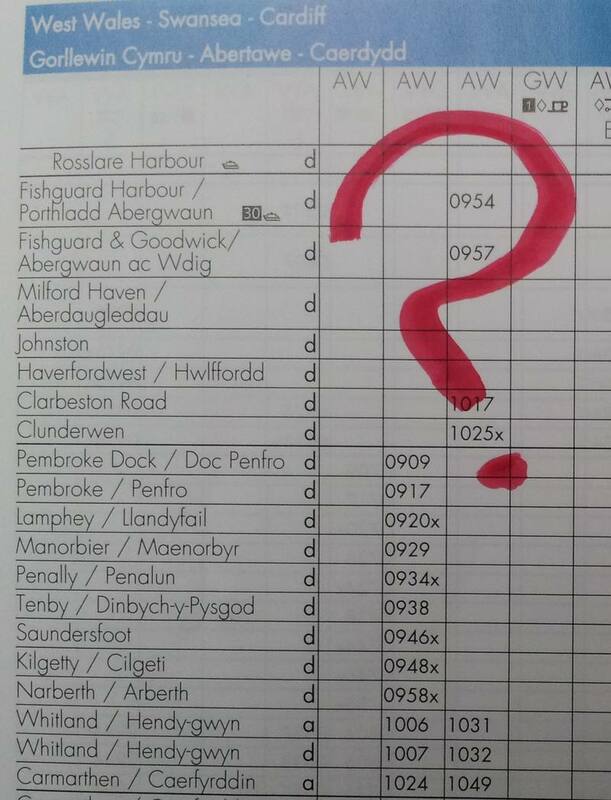 Traveline Cymru is the least poor, as it offers alternatives, including Fishguard & Goodwick Rail Station. But none of the other sites offer an alternative. Five sites will accept Fishguard & Goodwick (The Trainline, Raileasy, mytrainticket, National Rail and Arriva), but three will not even do that. Red Spotted Hanky and East Coast require you to guess Fishguard & Gwck, and Take the train comes in worst, accepting no kind of input for the station. To test if there is a general problem with station names containing and, or even just with long station names, Fishguard Trains tried the same tests with Elton and Orston, Haddenham and Thame Parkway, and Windsor and Eton Riverside. Elton and Orston comes out best. Five online sites accept the correct name, while four (mytrainticket, National Rail, Arriva and Traveline Cymru) demand an ampersand. But even faced with a long, four-word station name, three sites still manage to cope – Red Spotted Hanky, Take the train and East Coast all recognise the names Haddenham and Thame Parkway and Windsor and Eton Riverside just as they appear on the platform. The other sites require the ampersand. Thank you for your email. 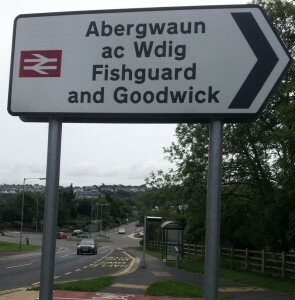 Fishguard and Goodwick is available to book tickets from on takethetrain.co.uk, the station is loaded under it’s correct name, Fishguard Harbour. Has this answered your question? If not, please let me know. Why does all this matter? 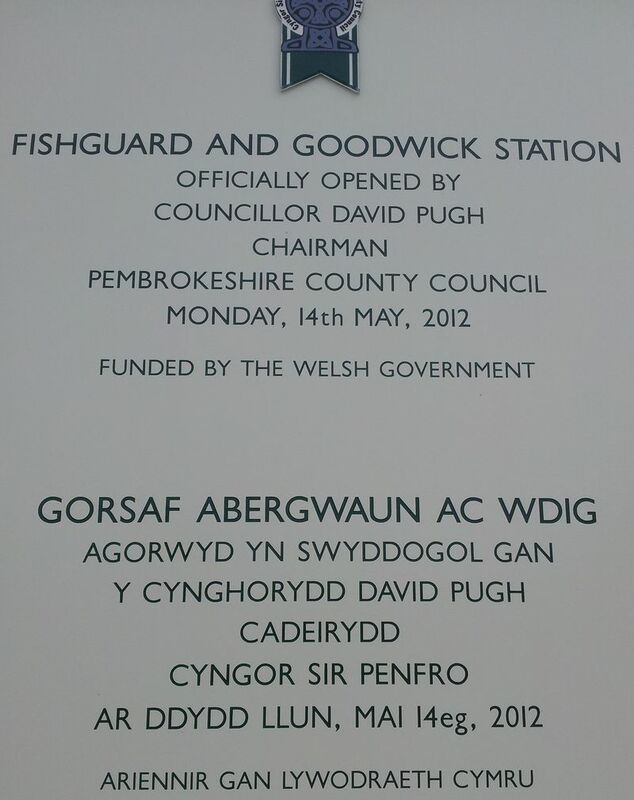 Pembrokeshire County Council and the Welsh Government (in other words we taxpayers and council taxpayers) funded the reopening of Fishguard and Goodwick as it is crucial to the viability of the new rail service. We have just one year left to ensure the service becomes permanent. It is unacceptable that not a single online booking service recognises the correct station name, and ludicrous that one online service does not even know the station exists. If despite these obstacles, people still travel by rail, but book to Fishguard Harbour, we still lose out as passenger statistics are distorted, and understate the impact of Fishguard and Goodwick. Next time you use one of these online services, why not send them a message to tell them we exist? Trains without tracks would be as useful as a chocolate teapot. So why do we talk so little about the tracks they run on? 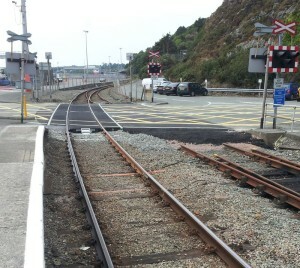 Here’s a story about tracks for a change – the track from Fishguard to Cardiff in fact – and a couple of concerns at each end of that line. 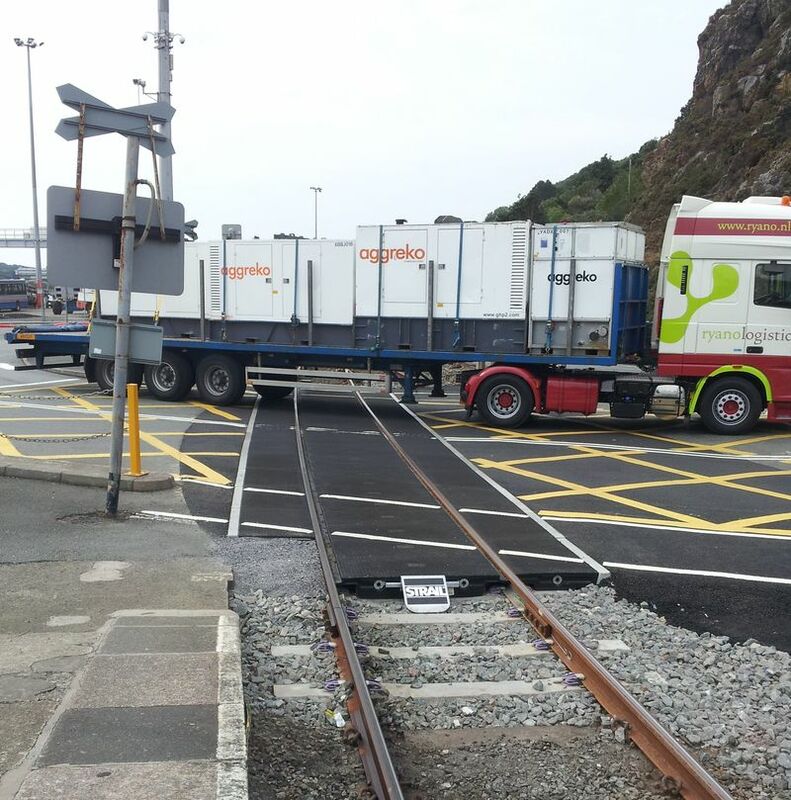 Something has changed at Fishguard Harbour. The passing loop that allowed an engine to be shunted from the front of an incoming train to the rear, ready to haul it out on the return journey has gone, cut off at the level crossing. Now there’s a gap where two tracks used to cross the harbour road. Instead we have a single track level crossing and a redundant siding. The nameplate on the new crossing gives us a clue to what’s going on. 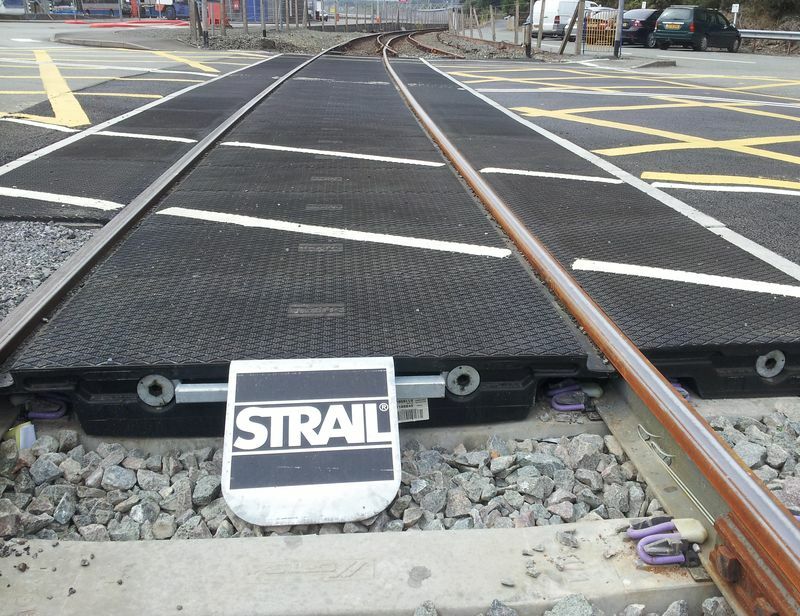 Strail is the trademark of Gummiwerk KRAIBURG Elastik GmbH, a German company contracted (amongst others) to Deutsche Bahn, owners of Arriva Trains Wales, to supply level crossing systems. Their system uses vulcanized rubber panels, and is designed to make life pleasant for both road and rail users. We’re puzzled by this. 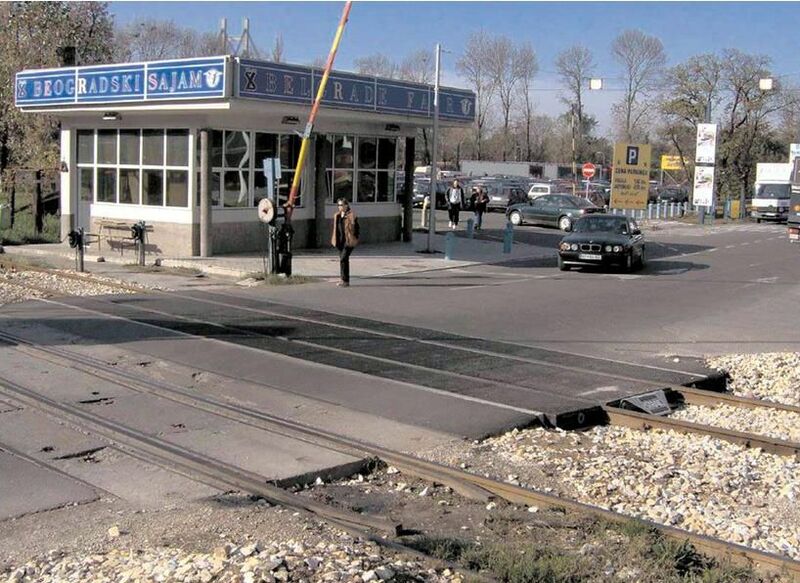 Strail systems are installed at level crossings of every kind all round the world – like this one in Belgrade. There must be plenty at twin-track crossings. Installing a new robust level crossing surely is no reason to remove our second track. Has something been lost? We think so. If you can’t swop an engine from the front to the rear of a train any more at Fishguard Harbour, that must cut out all kind of specials in future. Like the Jazz Special that there’s already talk about, following on the heels of this year’s successful Aberjazz Festival … but that’s another story. Here’s the east end of the line from Fishguard to Cardiff (which is probably the most popular destination from Fishguard). 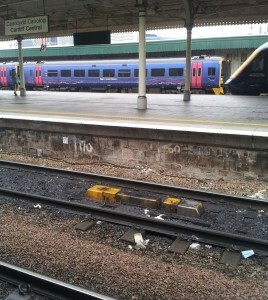 You’re looking at the track half way along Platform Four at Cardiff Central, just like Spad was doing the other day, when a heavy freight train rumbled through the station. Each wagon made a distinctive thud as it passed this point, so Spad came to take a closer look – and saw the rail moving up and down by at least a centimetre with each passing wagon. Look closely at the line where some litter has gathered in front of a hollow in the ballast. That’s the place where the track visibly flexes with each passing wagon. Steel is a wonderful material, but if it bends with every passing wagon, sooner or later it must fracture. Not wanting to wait for that to happen, Spad reported the matter to the station chargehand, who came straight over, thanked us, and made notes. 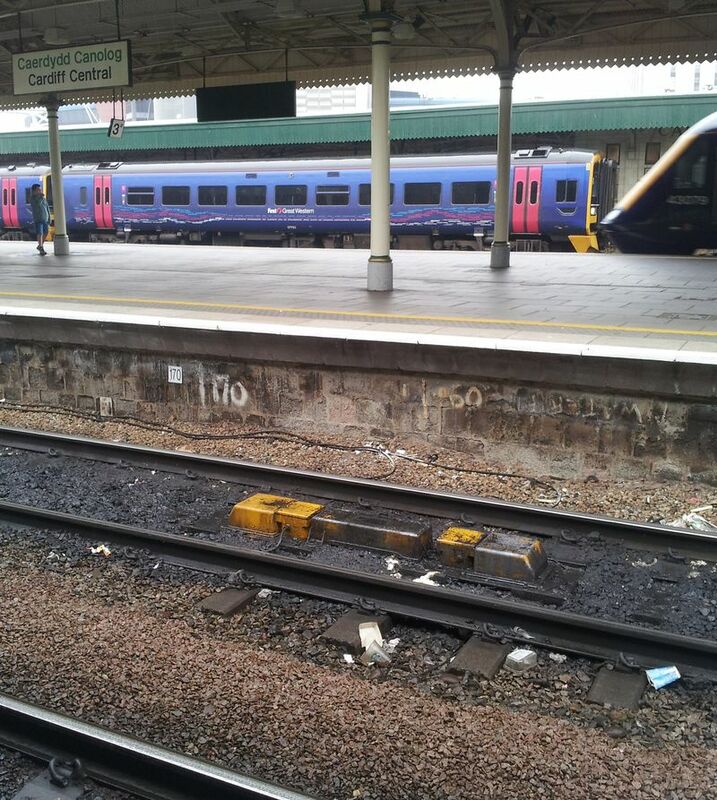 Next time you are at Cardiff Central, do check on Platform Four to see if the hole in the ballast has been fixed. This is not the first time Spad has stood on a platform and watched the rails moving (as opposed to the trains). The most dramatic was at the north end of Baker Street station on the Metropolitan Line to Watford. The rails were heaving up and down as each carriage passed, a movement of several centimetres. Recalling that sadly we said nothing at the time, made us keen to report the problem at Cardiff this time. But here’s the unsettling question: where else in some remote stretch of line, perhaps on a quiet rural branch, possibly on a high speed line, are the rails moving under each train as it speeds past? No travellers to watch, no one to report their concerns. Does anyone know? It’s not an easy thought. Are there any comforting answers? Following the restoration of boat-train links at Rosslare, through ticketing has also now been restored. Joined-up thinking! 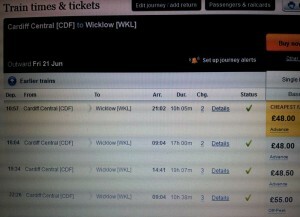 Here for example is the National Rail Enquiries page for a Cardiff to Wicklow journey this week. A choice of through fares, and a choice of routes too, as one of these services goes via Holyhead. Bristol to Wexford? London to Enniscorthy? Try it yourself. It’s all sensible, and it’s all welcome. Now we hope that people will use the new rail-sail-rail links through Fishguard to the whole of southern Ireland. 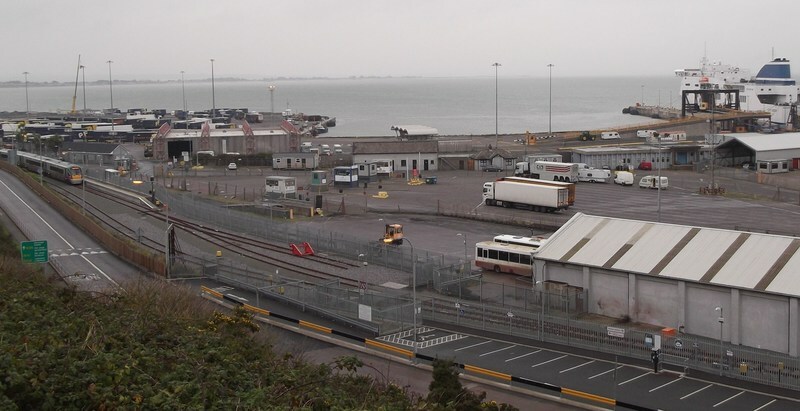 The new connecting times at Rosslare have only been granted for a few months – whether to save face in Dublin or because it’s a genuine trial we don’t know – so let’s see the service used and retained. News has just reached us that Irish Rail are restoring the link between Stena’s ferry service from Fishguard to Rosslare, and the onward rail connection to Wexford and Dublin. From Tuesday June 4th, instead of the evening rail departure leaving before ferry passenger can catch it, the service will be retimed so that afternoon ferry passengers can make the connection. 19.15 ex Rosslare Europort InterCity train. Arrives Dublin Connolly 22.17. Serves the usual stations en route. Will run M-S inclusive. On Sundays 19.00 Rosslare Europort to Bray InterCity, arriving 21.15. Change there to a DART (that’s the green electric trains that run around Dublin Bay). Arrive Dublin Connolly 22.12. 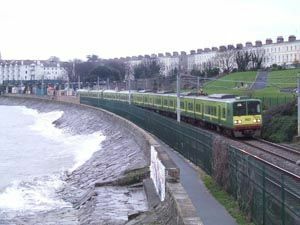 No one yet knows the reason for the change at Bray, but that’s no great problem – DART trains get you straight to many parts of the Irish capital, so changing there may be as convenient as changing at Connolly. Apparently the reason for the Tuesday start of the newly timed service is that Monday 3rd is an Irish Bank Holiday. There’s no doubt about it: this is tremendous news. With this single timetable correction, the southern Rail-Sail link from Wales to Ireland has been substantially restored. Now let’s look forward to a reopening of the Rosslare – Waterford line. Fishguard Trains congratulates everyone who has taken an interest and raised questions about the issue. We look forward to hearing in due course, how the nonsense of the disconnected service was challenged and overcome. Fishguard Trains today presents a new kind of timetable, live online and continually updated day and night. The timetable appears here on the right, and also on every page of the website. 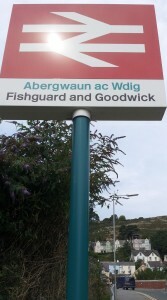 It is an electronic board for Fishguard and Goodwick, listing every departure (and arrival) at the new station, and much more besides. Beneath the clock you’ll see the whole week’s departures, with today’s services highlighted. Trains going east to Swansea, Cardiff and England are on yellow background, and westbound arrivals and boat trains for travellers to Ireland are naturally in green. Whatever the time, the next two trains due to leave Fishguard and Goodwick stand out with white times on black background. To make sure you don’t miss your train, the time changes to red in the last ten minutes before departure. That’s not all. Click on any departure, and you get more information – where it goes, the main connections you can make, notes on connection times (and warnings about occasional long waits), fast trains that bypass Swansea and so on. In this detailed view, direct destinations are in Bold, destinations that require a change in Roman, and stations that trains have come from are in Italic. Think of it as the Departure Board on the platform at Fishguard and Goodwick brought to your own computer or mobile. We hope you’ll find it useful. One thing the timetable does not present is delays and cancellations. For that you still need Arriva’s Live Departure information here. Though that has its odd lapses – try searching for the 23:45 from Swansea to Fishguard for example. So to plan your next trip, and to get to Fishguard and Goodwick station in good time for the right train, we think this timetable is the one to beat. What do you think? 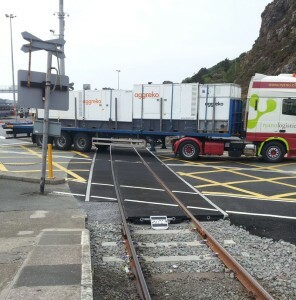 Fishguard Trains has supported our new rail service from the start with innovative timetables. Now with new summer 2013 times starting on May 19th, Fishguard Trains is going one better, and launching a live online train indicator board. This will be a timetable with a difference – not only lots of information, but updated night and day to show upcoming departures from Fishguard and Goodwick. What’s the time right now? Have I missed my train? When’s the next train, and where does it go? I’m going to London next Wednesday. When’s the first train? I’m going to Cardiff tomorrow morning, and I don’t want to change. Is there a through train? I missed this morning’s through train to Manchester. Can I still get there today? The new live indicator board is designed to be of practical use to all local rail users, and to encourage new users to try the train. Once you’ve used it for a while, let’s have your feedback – does it work for you? What’s missing? How could it be improved? So note the time and day in your diaries – May 19th: New times, new timetable. UPDATE MAY 19th – WOT NO TIMETABLE? In the meantime there’s a pocket timetable replacement service in operation at … well, its a good question. You can’t get a pocket timetable at either of Fishguard’s stations. 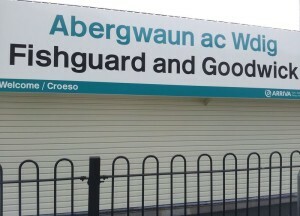 You could try the Tourist Information Centres in Goodwick and Fishguard. Our new online timetable will be going live as soon as engineering terminates possession. Apologies. 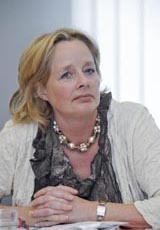 Nessa Childers, MEP for the Ireland East constituency, has raised the bi-national Fishguard Trains debate on the rundown of Rosslare with Ireland’s Transport Minister Alan Kelly TD. In the past week. Fishguard Trains has hosted an increasingly vigorous discussion about the alarming rundown of the rail-sail route through Rosslare and Fishguard. 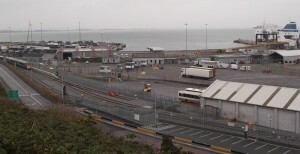 Commentators on both sides of the Irish Sea have noted the progressive loss of connections, closure of services and dismantling of walk-on walk-off facilities at the Irish port. When the question of a potential breach of European Regulations was raised, Fishguard Trains drew the attention of local MEPs in Wales and Ireland to the issue. We welcome this important issue receiving attention at the level it deserves. Fishguard Trains has also referred the issue to Welsh MEPs. With Dublin taking an interest, we hope that Cardiff will do likewise. Where are the people who make the decisions affecting public transport in Fishguard? Obviously not in Fishguard. But where are they? CARDIFF – Welsh Government has more powers over public transport in Wales than it did back in 1999. Still not enough to force bus and train operators to integrate their services. But enough to encourage Deputy First Ministers to spot the votes in restoring a decent rail service to North Pembrokeshire. BERLIN – HQ of Deutsche Bahn, one of the world’s largest transport multinationals, own most rail services and franchises in Wales, and a large slice of the bus action too. ABERDEEN – HQ of First Group, owners of First Great Western, franchised to run most of the rest of rail in Wales. 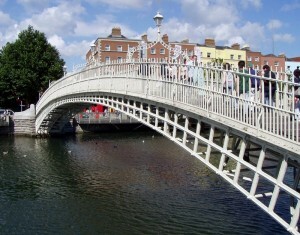 And there’s one more place – DUBLIN. * Have closed the walk on – walk off rail-sea interchange at Rosslare, and moved the station to the opposite side of the harbour (click the picture to see the new gap between ferry and train)..
No, it isn’t only you, SJ. It’s all of us on the west coast of Wales looking over to Ireland and wondering how long before the suits in Dublin pull the plugs on anything that doesn’t go by air, or at least sail out of the Liffey. – does travel to and from Ireland by rail and sea matter? – should the timetables make sense and and through ticketing work? – are we happy for all Wales-Ireland traffic to go through Holyhead? – should international public transport be made as easy as it is to continental Europe? How would we like our experience to be improved? 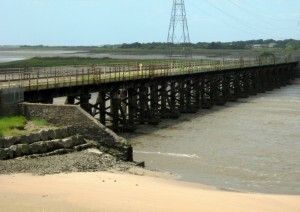 At a cost of £40 million to Welsh taxpayers and travellers, next month will finally see the single track line between Swansea and Llanelli redoubled. 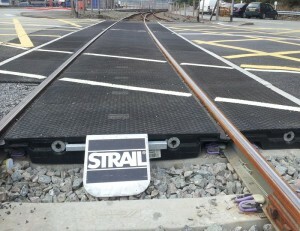 The project, jointly funded by Welsh Government and Network Rail (i.e. by us) corrects a historic mistake, a thirty-year old policy by Thatcher’s government (also taxpayer-funded in its day) to dismantle all but our highest-earning inter-city routes. We can celebrate, but remembering to keep watch for latter-day ‘rationalisers’ – Network Rail is on record contemplating the singling of the Swansea District Line – which will now come into its own for the duration of these works. From March 24th to April 6th, trains between Cardiff and west Wales will by-pass Swansea, using the Swansea District Line which normally only carries freight and the lunchtime Fishguard boat trains. See Arriva’s passenger information here. This may come as a welcome surprise for rail travellers to Carmarthen, Tenby and Haverfordwest, as the Swansea District Line is a far more direct route west, which of course was the point of building it a century ago. If the experience of a non-stop service between Port Talbot and Llanelli raises interest in the future of this line, that will be a real bonus. Naturally most rail traffic will continue via Swansea in future, even with the additional passenger services on the SDL we hope for. A double track west from the city will remove a serious obstacle to growth, eliminate delays and the knock-on effect of delays, and allow increased reliability and timetable frequency of services on all three Pembrokeshire branches. So there’s quite a lot to celebrate.